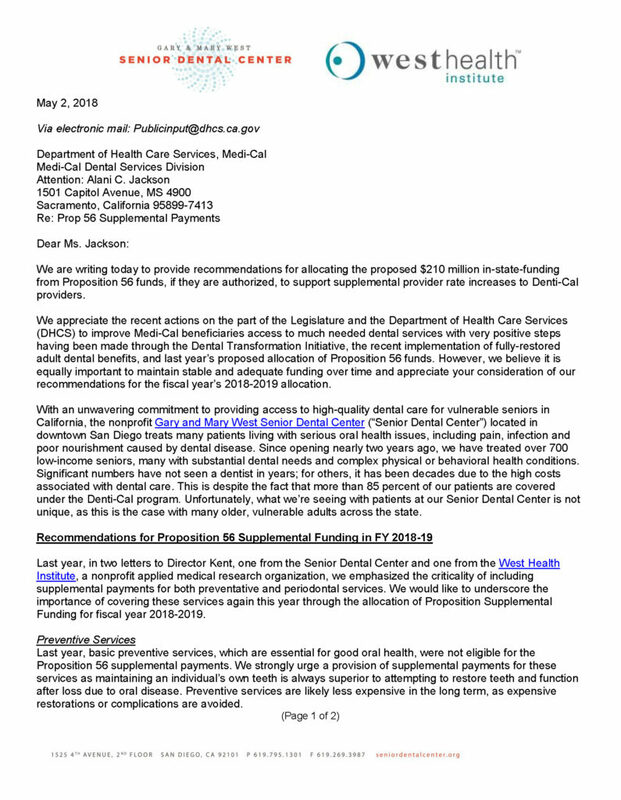 We are writing today to provide recommendations for allocating the proposed $210 million in-state-funding from Proposition 56 funds, if they are authorized, to support supplemental provider rate increases to Denti-Cal providers. We appreciate the recent actions on the part of the Legislature and the Department of Health Care Services (DHCS) to improve Medi-Cal beneficiaries access to much needed dental services with very positive steps having been made through the Dental Transformation Initiative, the recent implementation of fully-restored adult dental benefits, and last year’s proposed allocation of Proposition 56 funds. However, we believe it is equally important to maintain stable and adequate funding over time and appreciate your consideration of our recommendations for the fiscal year’s 2018-2019 allocation. With an unwavering commitment to providing access to high-quality dental care for vulnerable seniors in California, the nonprofit Gary and Mary West Senior Dental Center (“Senior Dental Center”) located in downtown San Diego treats many patients living with serious oral health issues, including pain, infection and poor nourishment caused by dental disease. Since opening nearly two years ago, we have treated over 700 low-income seniors, many with substantial dental needs and complex physical or behavioral health conditions. Significant numbers have not seen a dentist in years; for others, it has been decades due to the high costs associated with dental care. This is despite the fact that more than 85 percent of our patients are covered under the Denti-Cal program. Unfortunately, what we’re seeing with patients at our Senior Dental Center is not unique, as this is the case with many older, vulnerable adults across the state. Last year, in two letters to Director Kent, one from the Senior Dental Center and one from the West Health Institute, a nonprofit applied medical research organization, we emphasized the criticality of including supplemental payments for both preventative and periodontal services. We would like to underscore the importance of covering these services again this year through the allocation of Proposition Supplemental Funding for fiscal year 2018-2019. Last year, basic preventive services, which are essential for good oral health, were not eligible for the Proposition 56 supplemental payments. We strongly urge a provision of supplemental payments for these services as maintaining an individual’s own teeth is always superior to attempting to restore teeth and function after loss due to oral disease. Preventive services are likely less expensive in the long term, as expensive restorations or complications are avoided. Supplementary payments for preventive services may also be a key to improving access for Denti-Cal patients. Preventive services represent a large share of the continuing care provided to a practice’s patients. The challenges that practices face due to low Denti-Cal payments are most severe for those dental practices serving larger numbers of Denti-Cal patients. Supplementary payments for preventive services will assist these practices in maintaining or increasing access for Denti-Cal patients. Periodontal services should also be eligible for supplemental payments. The prevalence of periodontitis and other forms of gum disease increases significantly with age. Moreover, there is strong and growing evidence of the relationship between these conditions and medical problems, most notably diabetes and heart disease. Periodontal services are a prime example of how adequate oral healthcare can help to avoid future higher costs of medical care. Now that the adult benefits have been restored, a review of coverage criteria details is critical to ensure that all persons that would benefit from essential periodontal services have coverage. We support the comments provided to the DHCS from a number of consumer groups regarding the importance of transparency and accountability for expenditure of Proposition 56 supplemental funding. Adequate investments in data collection and analysis to evaluate the impacts of supplemental funding are essential. A Stakeholder Advisory Board created by DHCS and suggested by these groups could provide important input and assistance in developing clear standards for evaluation of Proposition 56 supplemental payments and increase confidence about its effective deployment. Effective allocation of fiscal year 2019 Proposition 56 funding is an important step in improving the Denti-Cal program. However, we recognize that additional actions are needed to move Denti-Cal even further toward becoming a true dental care safety net for all program beneficiaries. Our submission to the Little Hoover Commission’s Denti-Cal Public Hearing on March 22, 2018 outlined some possible actions with positive benefits. We continue to advocate for providing additional payment to cover services for patients with special needs that require complicated treatment for high-volume dental practices to ensure their ability to serve larger numbers of Denti-Cal patients.